How Much Should You Pay for Business Web Hosting? I have talked about in the past how important it is for any business to choose the right web host. If you are just starting up or just gaining momentum in your business, you can’t afford not to give your business the best chance to succeed. Many small business owners have the temptation to go with the cheapest web host possible. Some don’t mind paying a few more dollars for those unlimited plans. In reality, you can’t have a free lunch and eat it too. World class web hosts offer very reliable services to their customers, but they will need to charge higher to keep offering high quality service. Those who pay $10 a month for their web hosting service and expect to get the best service in the world are dreaming. If you are a start-up owner and have big plans for your business, you want to invest in a service that keeps your web services up 24/7. The last thing you want to do is leave things to chances and prayer. Besides, it would leave a very bad impression on your new customers if your service is down frequently. 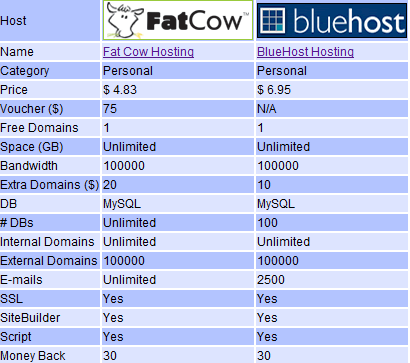 There is more to web hosting than just comparing numbers. Take the below hosts for example. They are great for small businesses that are starting but don’t plan to get too big too soon. They are great for bloggers and those who don’t intend to offer a web service (e.g. Twitter). But you can’t just compare the numbers and choose one of these services for the next YouTube. If you have a big idea, you may want to invest in a private hosting service. A private server does allow you to customize your resources and software packages that are used on your server. If you want more scalability, you can always go with cloud computing. Amazon Web Services provide you with a host of services that you can use to host your websites and get your resources increased on demand when you have more traffic coming to your website. RackspaceCloud is another cloud hosting service that lets you build scalable services and reduce your downtime with your killer startup. These services all cost you more than just $10 a month, but they provide you with scalable web hosting that let you decrease your downtime and leave the best impression on your customers. You won’t find these services on any of those web hosting comparison services. Just because these services are more expensive, it doesn’t mean you should ignore them. Not if you have big plans for your business. i-netpreneur » Start a Business » How Much Should You Pay for Business Web Hosting?